Just Launched is a new series on MENAbytes that will cover digital products and services that have recently launched (six months). Cairo-based Hive solves a simple problem: connecting parents with reliable school transportation options through its mobile apps for Android and iOS. Started a few months ago, the startup launched its mobile apps (for Android and iOS) last month and is currently available in Cairo. 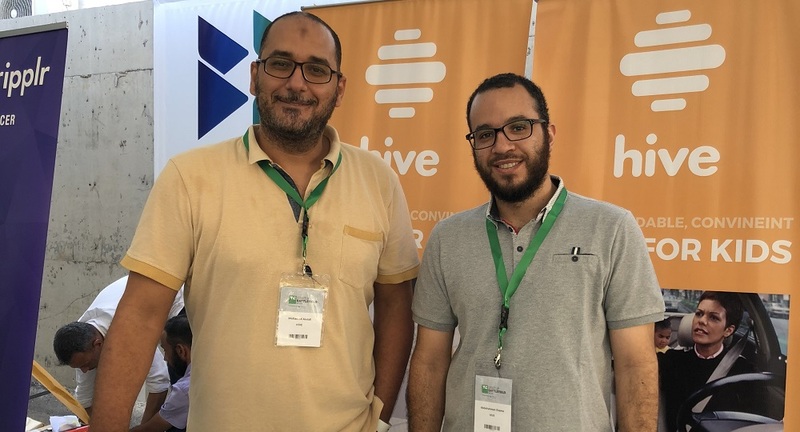 Founded by Abdelrahman Osama, a UX consultant with 20 years of experience in Egypt & Malaysia, and Mohamed Aboali, who comes with over 20 years of experience of building different technology products, Hive currently has a team of eight employees working from its Cairo office. The startup that was founded less than eight months ago has already received an angel investment and is currently looking to raise more. We sat down with Hive’s co-founder and CEO Abdelrahman Osama to learn more about the product. Here’s what he had to say. Think of it as a subscription-based ride-hailing solution for school going children. We had started by daily school rides in Cairo for a certain age group but now we’re looking to cover transportation for school going children of any age in Egypt and beyond. We started by a simple Facebook post on a newly created page with newly designed brand in just three days and it sort of went viral reaching 75,000 users organically with over 300 shares and we ended up receiving 2000 requests for daily school rides for over 4,000 children through a Google form in less than two months. Parents download the app, register themselves, and add the school and their home address, and some details about the child(ren). Hive receives the requests and creates a group of four children living nearby going to the same school. Hive’s staff then assigns a captain for this group and arranges meeting between the captain and parents where all the documents including copies of license, national ID, drug tests, and criminal records are present to the parents. Once accepted, parents pay one month in advance and another fifteen days as insurance. After this, the subscription is activated and the captain takes children to school and brings them back to home on daily basis. The parents can track all the rides on the app. For 0 to 6 KMs of distance between home and school, we charge 600 EGP per month per child, 735 EGP for 6-10 KMs, 870 EGP for 10-14 KMs, and 1070 for 14-20 KMs. All the packages include two-sided trips for the entire month. Why the world needs it? School transportation is starting to become very expensive. One of the schools that I know of used to charge 10,000 EGP as annual school bus fee has increased it to 14,500 EGP. But at the same time, kids have to spend long durations in buses as there are tens of students in every bus – this time that could be used by them on different things. Another option for parents is private cars or micro-buses that are known as “Dawrat Madares”. Now they are perhaps cheaper than Hive but are not as safe and convenient. We had started with Nasr City & 5th Settlement in Cairo – that’s where we were getting most of our requests from. But now we are also available in a few other neighborhoods including Mokattam and Maadi, and we should be available in 6th of October as well in the next few weeks. We have started with a small pilot as we’re trying to improve our operations and technology by learning from it. As of today, we have about 70 children with us who are making 180 weekly trips. We’ve just completed 3,000 trips. We match captains and parents and then moderate the relationship. In return, we keep 20% from the subscription as service fee and the rest of 80% goes to the captains. We might add some additional revenue streams in the future. We have some really big plans for the future including expanding our offerings to pre-school nurseries. It is something we’ve been planning for some time now and will be launching very soon. Apart from that, we will continue to expand to more areas in Cairo and then expand beyond the city later this year. To pitch MENA-based digital products and services that have launched during the last six months for coverage on MENAbytes, please email hello [at] menabytes [dot] com.